The Ozrics are masters of the hypnotic groove, finding that seemingly endless psychedelic guitar and synth riff, a repetitive - nearly trance-like structure, and then exploring all of its possibilities to some sort of conclusion. The writing isn't particularly flashy, certainly not complex, nor does it have many of the traditional progressive traits. But the music, embellished by plenty of synth dweedling and strong rhythm patterns, is nonetheless powerful, and does take the listener somewhere special if the mind is open and the spirit free. The latest disc Arborescence is no different. The focus is only slightly different from previous releases, so anyone who was looking for some grand scale changes can rest assured that there are no major surprises here. The tracks alternate between power-drive ("Myriapod," "Shima Koto," "Astro Cortex"), more spacey tunes ("Dance of the Loomi," "There's a Planet Here," the title track), and those with a specific ethnic flavor ("Al-Saloog"). Of course that's the same as all the other Ozrics albums before it - which I suppose means the band is in a huge rut, offering only predictability, or perhaps consistency. Either way, they do one thing very well and that's exactly what they've done here; after twelve-plus albums I'm not tired of it yet. The Ozrics seem to be believers in the old saying, "If it ain't broke, don't fix it." They've found a style that works for them and that their fans seem to like. On this, their latest release, they've recorded 45 minutes of music that uses ideas from their previous four studio CDs, especially Erpland and Pungent Effulgent. As usual, Ed Wynne's guitar is the focal point of the music, with the expected swishy keyboards and repetitive bass lines simple enough to be sequenced (in some cases, I'm pretty sure they are). The drummer plays snare-bass rhythms and, unlike Strangeitude and Jurassic Shift, adds some interesting fills. But as a whole the band rarely breaks 4/4, uses the same key changes, many of the same riffs, and the same basic feel and sound as their previous works. What this adds up to is that fans of the old Ozric sound will most likely enjoy Arborescence, while those of us looking for something new and exciting (or even slightly different from their previous work) will be impressed with how well Ozrics can repeat themselves. 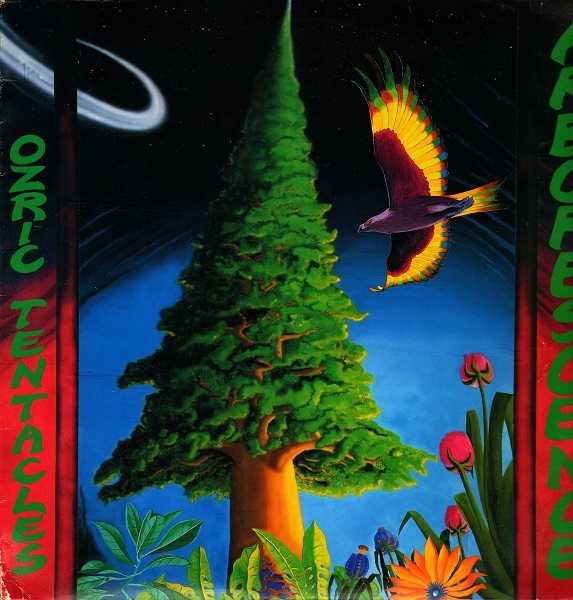 With Arborescence Ozric Tentacles have their fifth studio effort in as many years. As usual the texturing of the soundscape remains their focus and their foremost strength. Alarmingly unique in their ability to dress up crude and simple compositions with unbelievably rich synth textures and electronic effects/samples, the Ozrics certainly make up for their lack of songwriting with production and atmospherics. But they've been doing that for 10 years now, and for many longtime fans the formula has grown tiresome. Some feared that the Tentacles would sell out when they signed with IRS but, in fact, the opposite has happened - they have set new standards in stagnation. Those who have never heard Ozrics before shouldn't let this stand in their way, though. Arborescene is as good a place to start as any, with the trademark Hillage-like guitar, gurgling and whirling synths, tight (but awfully simplistic) bass and drums, wrapped around rave, techno, African, and Middle Eastern influences. Highly recommended for beginners, but not much to get excited about for those who have been following the band for more than two albums.